It is cleared in public eye that Malaika and Arjun are dating each other. Actor Arjun Kapoor and TV persona Malaika Arora are trending every other day these days. Both of them have been making joint appearances outside, however, recently the love and romance has blossomed on social media platforms. Instagram has suddenly become the go-to platform for couples to make their relationship official. One heart on Insta and there you know that the PDA has begun; especially in the case of rumored couples like Malaika Arora and Arjun Kapoor, who are yet to make their relationship official. The rumor is that Arjun and Malaika are all set to get married next year. It's stimulating how Malaika didn't wary away from plummeting a 'hot blazing' comment on Arjun's Insta post, despite knowing that all eyes are on the two. In fact, this is one of the firsts for Malaika considering how she has never really commented on Arjun's post, unlike the latter who is a frequent liker on Malaika's posts. More recently, Malaika and Arjun were also spotted together at the airport, after secretly ringing in Malaika's birthday in Italy. Malaika and Arjun are yet to declare their link-up rumors anytime soon. OMG - Arjun and Malaika Have Set a Date! Arjun Kapoor Reveals His Relationship Status on Koffee! Malaika and Arjun are Tying the Knot Soon! Malaika Arora Calls #MeToo "Just Noise and Nothing Else!" Will Arbaaz and Malaika be Back Together? OMG! Malaika & Arbaaz To Split? Malaika Arora And Arjun Kapoor to have a white wedding in April? Here's what Malaika Arora has to say about marriage with Arjun Kapoor! Did Karan Johar just confirm Malaika Arora's marriage with Arjun Kapoor? 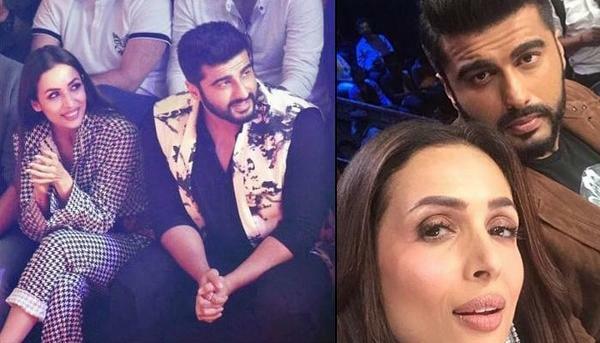 Malaika Arora and Arjun Kapoor were in Dubai on the same day? Arora Sisters Say It All! Sonakshi and Arjun Ke "Tevar" To Dekho! Will Dippy and Arjun Find Fanny?